Surfer Brian Smith landed in California in 1978 with a passion for sheepskin boots, leading him to found UGG and create one of most distinct and popular pairs of boots in fashion history. The UGG women’s shoes collection features alluring shearling fur boots, fur slippers, booties, and more, each offering the same superior comfort and protection that the brand is known for. Complement your outfit for an adventurous outing or a casual day at home with hallmark UGG creations. 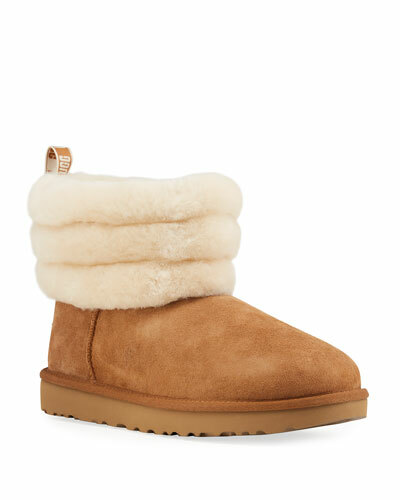 Neiman Marcus offers an amazing range of UGG booties, fur boots, slippers, and more in a variety of colors and styles. Rag & Bone leather ankle boot. 1.5" stacked block heel; 5"H shaft, 9" top circ. Round toe. Gored side insets. Rag & Bone leather ankle boot. 1.5" stacked block heel; 5"H shaft, 9" top circ. Round toe. Gored side insets. Pull-tab at backstay. Leather lining. Smooth outsole. Padded footbed. "Walker" is imported of Italian material. Saint Laurent eel leather bootie with oversize logo buckle detail. 5.5" block heel with platform. Round toe. Side zip eases dress. Leather lining. Smooth outsole. Made in Italy. Fit note: Saint Laurent shoes run small. Please order a 1/2 size larger than you typically wear. Saint Laurent suede booties with western buckle detail. 2.3" covered heel. Pointed toe Side zip eases dress. Leather lining. Smooth outsole. "Charlotte" is made in Italy. Fit note: Saint Laurent shoes run small. Please order a 1/2 size larger than you typically wear.